Born in Siena, Italy; died 1361. 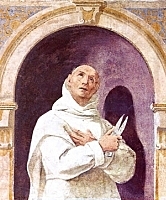 Peter became a Carthusian monk at Maggiano near Siena in 1328. His thoughtful charity was instrumental in the conversion of Boccaccio (Benedictines).